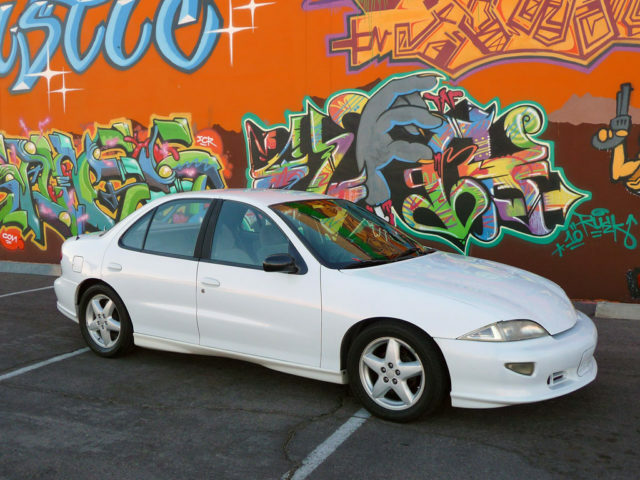 For many young people, getting their first car is so much more than a means of transportation. A car is a symbol of freedom, mobility, and also responsibility. Getting your first car is a rite of passage as one transitions from adolescence to adulthood, much like getting your first job. In the sprawling suburbs of large cities, having a car is not just a luxury, it is an essential tool for everyday life. 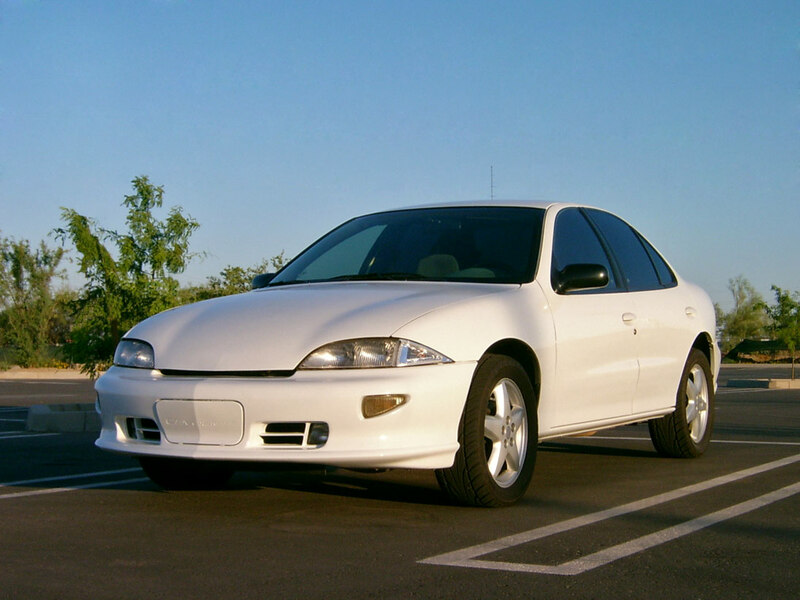 My first car was a 1995 Chevrolet Cavalier, but it certainly wasn’t the first one in our family. My mom had owned one back in Massachusetts, where cars and rust go together like fish and chips. 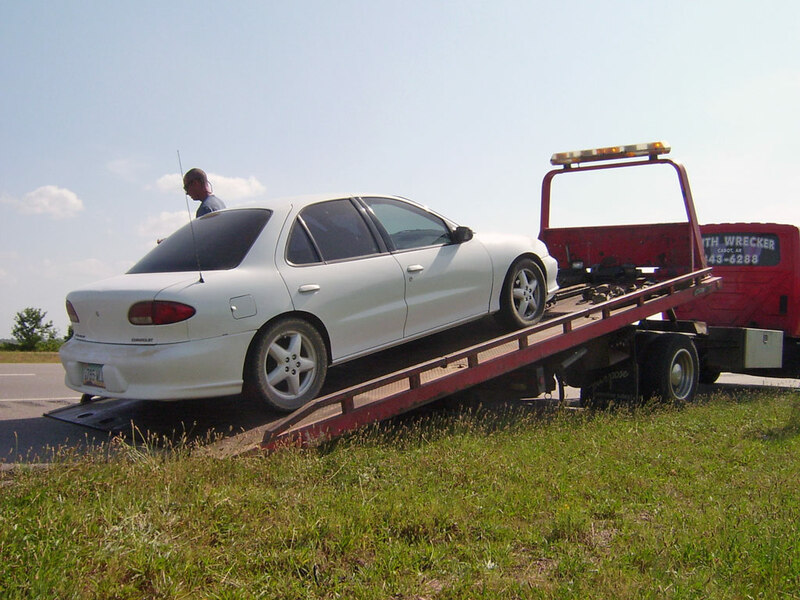 Her car had seen a few winters and would leak gas from a hole in the tank if the car was parked on a hill. I was 11 years old when my mom bought her next Cavalier. It was 1996 and her clunker of a 1991 Ford Tempo was on its last legs. She traded it in for a 1995 Cavalier sedan with 40,000 miles on it. She drove the Cavalier for the next eight years and gifted it to me in 2004. At the time of this writing (2018), the car is now 23 years old. It has been mine for 14 of those years – much to the dismay of my family and friends. Where do you begin to tell the story of a car that’s been around so long, it is like a member of the family? The Chevrolet Cavalier was part of the “J Body” platform which was a family of compact, front-wheel drive cars made by General Motors starting in 1982. The Cavalier (and its badge-engineered cousins from Pontiac, Oldsmobile, and Cadillac) followed the industry trend with boxy, square designs throughout the 1980s, but all that changed in 1995. 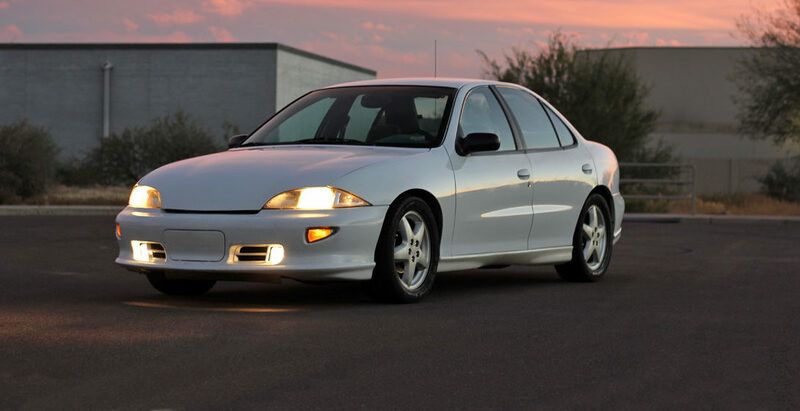 Though it had essentially the same chassis and suspension, the 1995 Cavalier had an all-new exterior design that was completely different from the boxy look of the past. It was also notable for being the cheapest car in America with Anti-Lock Brakes as standard equipment, which was a feature exclusive to high-end luxury cars just a few years earlier. My mom’s car was a base model sedan with no amenities. Under the hood was a 2.2L engine making 120 horsepower and an automatic transmission. It had manual windows, mirrors, door locks, and seat sliders. There was no cruise control, no cassette or CD player, not even a tilt steering column! The outside wasn’t much to look at, either. It had these cheap looking plastic bumpers and 14-inch wheels with hubcaps. It was a very basic and simple machine with zero pretense of sportiness. The Cavalier was the car of my childhood. It was the car my mom drove me to school in. It took us to the grocery store, church, doctor’s appointments, and everywhere a family goes. It was the car I washed for her on Mother’s Day. It was always there. I got my driver’s license at age 17, the same month I graduated high school. The Cavalier was the car that I borrowed to go visit friends, to run to the store, and for a few awkward dates. 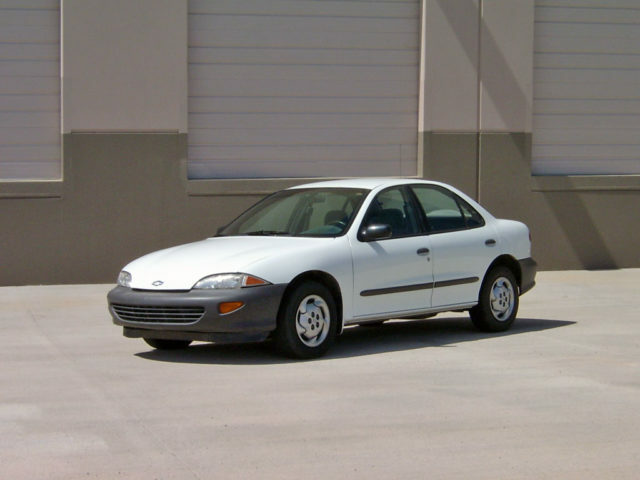 The following year, my mom bought a brand new 2004 Chevrolet Cavalier and instead of trading in her old one which now had 85,000 miles, she gave it to me. As a side note, my dad also bought a Cavalier brand new in 1997. At one point, we had three of these things in our family! 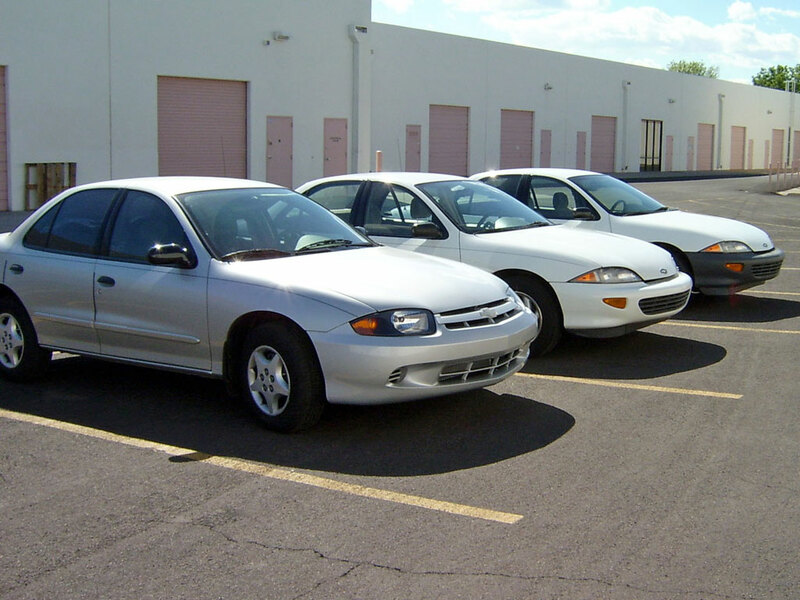 At one point we owned three Cavaliers in the family: a 2004, a 1997, and my 1995 model. I started community college that fall, and in the spring found a part-time job. That meant I had a little bit of money to spend on the car. At first, it started with the essentials. The brakes were long overdue for replacement, which I took care of. My first big purchase was a stereo upgrade. Wal-Mart had this “car stereo in a box” deal from Pioneer that included four speakers and a basic AM/FM/CD player for $99.00. I purchased the mounting kit, wiring harness, and installed it all myself! 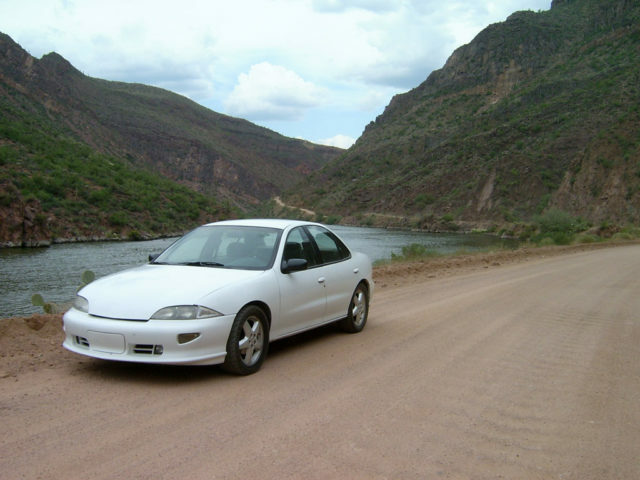 I also registered an account on j-body.org, an Internet forum for Cavalier/Sunfire owners. Though I was but a broke teenager, I was enamored with the pictures of other J-Body owners building cars with body kits, turbochargers, and other customizations. I learned a tremendous amount of knowledge about these cars just by reading through the forums. It wasn’t long before I did some bigger upgrades to the car. It started out with removing the dealership branding, removing the exterior molding trim on the doors and door jambs, and I even upgraded the factory gauges to the one with a tachometer. I had limo tint installed – 35% on the front windows and 5% “blackout” tint on the rear windows. 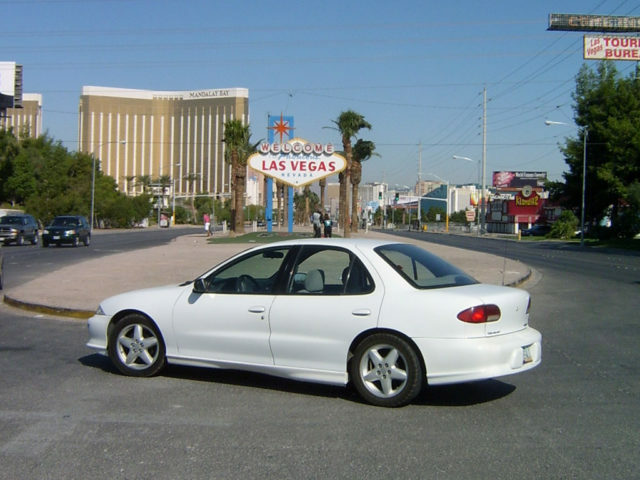 Next, I ditched the 14″ steel wheels and hubcaps for a set of 16″ aluminum wheels from the Cavalier Z24. I also purchased used front and rear Z24 bumpers and fog lamps. The fact that I had no previous experience did not deter me from sanding, priming, and painting the bumpers myself in a friend’s garage. The finished result had a bit of orange peel texture to the paint, but I was very proud of my work. 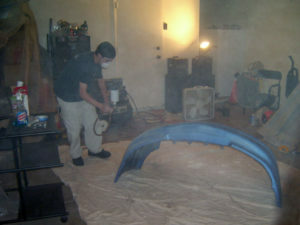 Me painting the Z24 bumpers in a friend’s garage in 2005. The body-colored bumpers looked worlds better than the original ones. After that, I wanted to make this economy car a bit more luxurious. I purchased and applied 100 sq ft of B-Quiet Ultimate (basically a cheaper knock-off of Dynamat) beneath the carpeting and seats. Finally, I painted the brake calipers and drums. 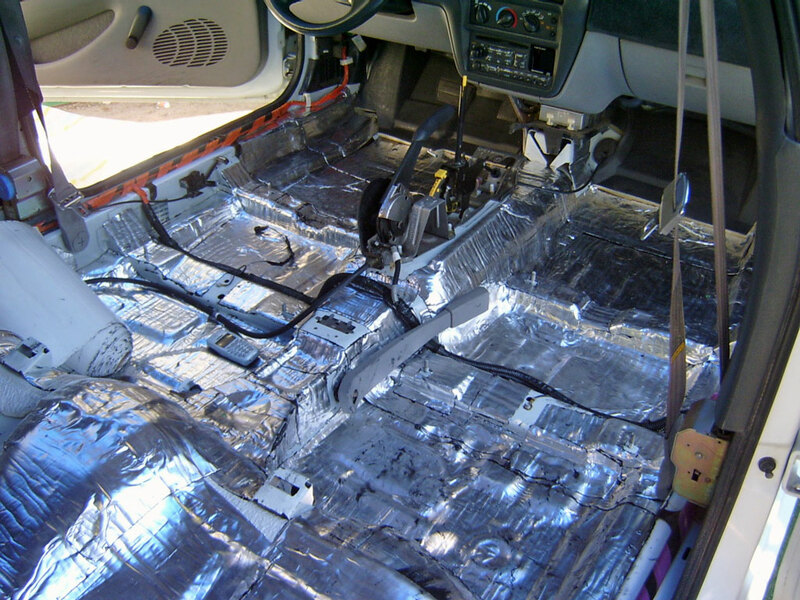 Installing B-Quiet sound dampening material (similar to Dynamat) beneath the carpet in 2005. At some point, the maintenance costs of the car started to ramp up and I stopped spending money on modifications. The car has a 3-speed automatic transmission (same one as the Pontiac Fiero) and by 2008, the bands in 2nd gear had completely worn out. The car was getting terrible mileage, and it was the point at which a smart person would have gotten another car. But I am not a smart person, and I paid a transmission shop $1,750 to rebuild the transmission. They also installed a TransGo shift kit, which corrected several flaws in the original design. Driving the Apache Trail National Scenic Byway in 2007. The next few years were filled with more regular maintenance items: brakes, batteries, tires, oil changes, etc. 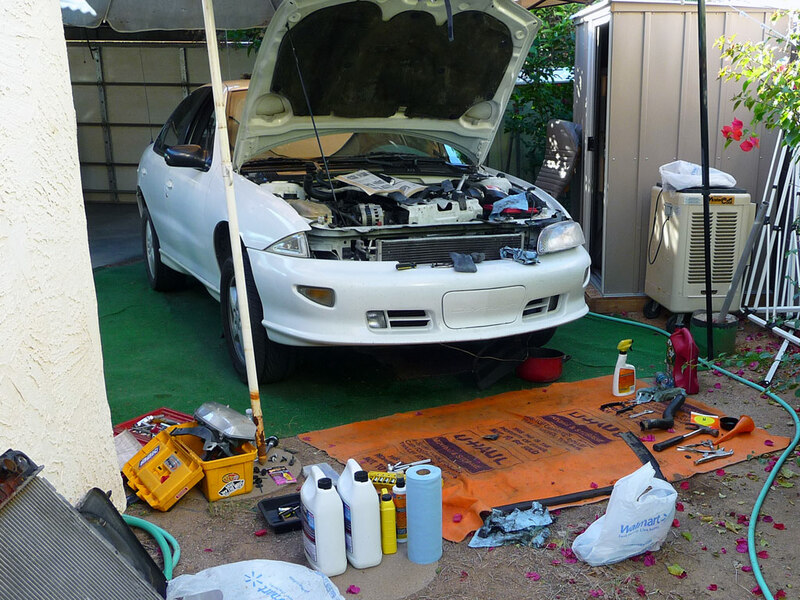 The random repairs started to pop up with increasing frequency: a bad fuel injector, a new EGR valve, an oxygen sensor, an ABS speed sensor, new tie rods, a new A/C compressor and a radiator. I was convinced that in spite of the constant repairs, I was still doing better than if I were making monthly payments on a newer car. By 2011, it was evident that no amount of money would ever bring the Cavalier up to the level of comfort and reliability that I wanted. I had begun to research potential replacement cars and started saving money. However, I am the type of person to get myself bogged down with research. I made spreadsheets, read reviews, and compared metrics on a dozen different cars. I knew I wanted a sedan, but I was paralyzed with indecision over which one to get. After some deep thought, I made a list of criteria that was most important to me. 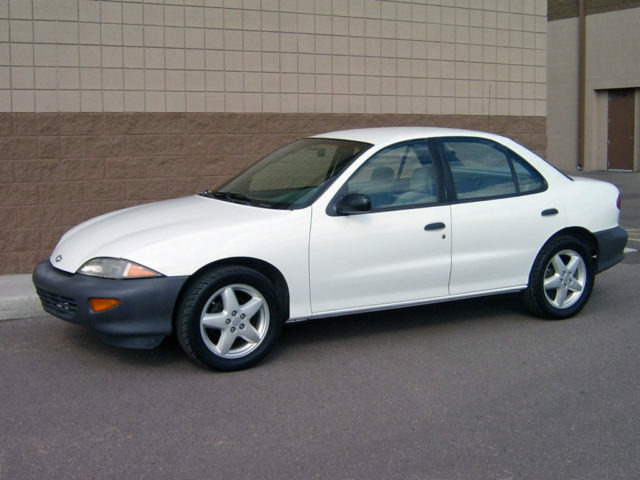 I decided that reliability was the most important, because it was the thing I disliked the most about the Cavalier. I also wanted the new car to be a good highway cruiser that would be comfortable for long trips and have cruise control. 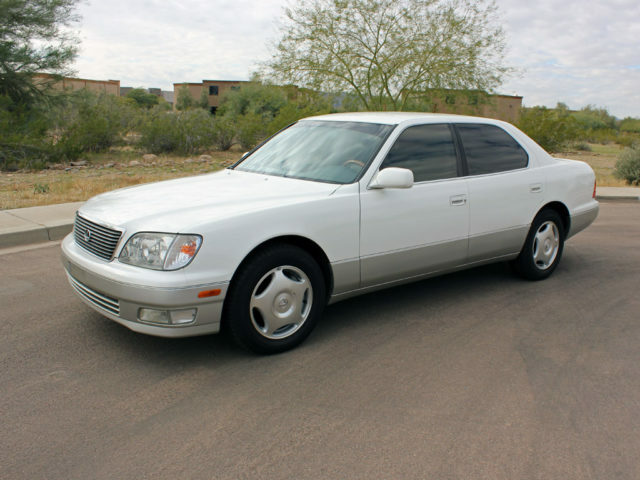 I had narrowed my choices down to the Subaru Legacy GT, Toyota Camry XLE, Lincoln LS, Infiniti G35, and Lexus LS400. After reading about the history of the Lexus, I decided that this was the car for me. In December 2013, I paid $7500 cash for a used 1999 LS400 with 126,000 miles. The Lexus replaced the Cavalier as my everyday car in late 2013. With the purchase of the Lexus, I no longer needed the Cavalier. Again, a rational person would have sold or donated the car. But I was emotionally attached! The car and I had been through so much together. I had invested so much of my time, energy, and money into it. When I thought about the trips I had taken and the friends who had ridden in the car over the years, it made me too sad to think about getting rid of it. So I didn’t. With the Lexus now serving as my main car, the Cavalier was reduced to a backup / second car that I would use for small trips. For example, running to the post office or grocery store, or perhaps if my main car had a flat tire or a dead battery. Still, that doesn’t mean the last few years have been cheap. The car still required registration and insurance. In 2014 I replaced the battery, and in 2017 I replaced the worn out tires I had purchased 9 years earlier in 2008. I also replaced the serpentine belt and tensioner after the belt shredded itself. The car sat inoperable for almost a year due to what I later learned was a bad fuel pressure regulator. During this time the car was broken into and the ignition was damaged, although nothing was stolen. I had to drill out and replace the damaged lock cylinder, which was not fun. During the past 5 years, I put just 4,000 miles on the car. It spends a lot of time parked these days. I still keep it around for the nostalgia it brings me and the novelty of having a car where you accept its imperfections (there are many). I had always believed that if you took care of your things, they would take care of you. I no longer believe that to be true. A thing that is poorly designed and cheaply built will eventually let you down, it is just a matter of when. As of 2018, the car is 23 years old and has 188,000 miles on it. It simply wasn’t meant to last this long, and it’s cost me more to keep it on the road than a rational person can justify. I made the mistake of getting emotionally attached to the car. There’s nothing particularly special about Cavaliers, or this one in general. They were not rare or high performance cars, and this one does not have any special provenance or history. It is very basic in its amenities with manual windows and locks, no cruise control, not even a tilt steering column! 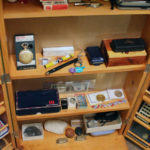 It is very unlikely to ever be collectible or increase in value. In fact, Kelly Blue Book says the value of the car is about $600 – which is what you’d get for the metal at a scrap yard. But then, I have a lot of memories with this car. I drove it to Las Vegas, before the bypass bridge opened and you could still drive over the dam. I took the car on a trip to Mississippi, across six states and 1,500 miles. I drove it on the Apache Trail and all over Arizona. I drove it everywhere, to work, to school, and most of the time, it got me there. The silver lining of driving an unreliable car is that it taught me a lot about working on cars. Armed with some basic hand tools and a Chilton’s repair manual, I have replaced the water pump, radiator fan, radiator, starter, spark plugs and wires, fuel filter, serpentine belt and tensioner, and the ignition lock cylinder on the car. Replacing the radiator in 2012. Still, there were plenty of times where I did have to bring the car to a professional for repairs. One time in 2007, I drove the car from Arizona to Mississippi and back to attend a wedding. Driving home, the alternator died about 40 miles outside of Little Rock, Arkansas. Had to have it towed to a shop and a new alternator installed. In 2011, one of the hoses to my auxiliary transmission cooler burst while I was driving on the freeway. 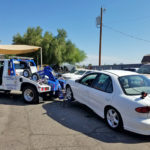 I had the car towed to the same shop that rebuilt the transmission in 2008, where they replaced the hose. 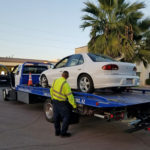 In 2015, the Torque Converter Clutch (TCC) solenoid failed, which caused the car’s engine to stall when exiting the freeway, creating a very dangerous situation. I had that replaced by a local transmission shop in February 2017. 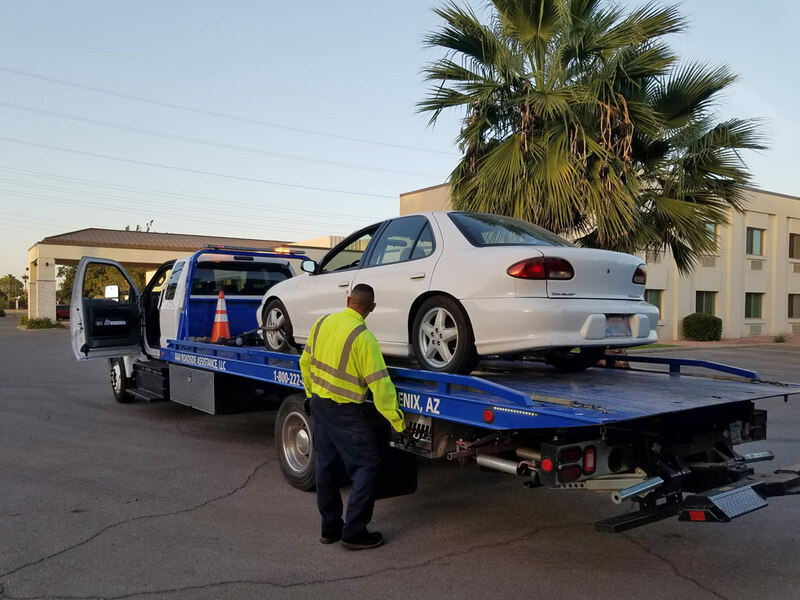 The car ran great for a few months until October 2017 when the engine completely shut off while driving, and I had to have the car towed home yet again. I thought it might have been the fuel pump or possibly a faulty injector, but I did not know how to troubleshoot it. 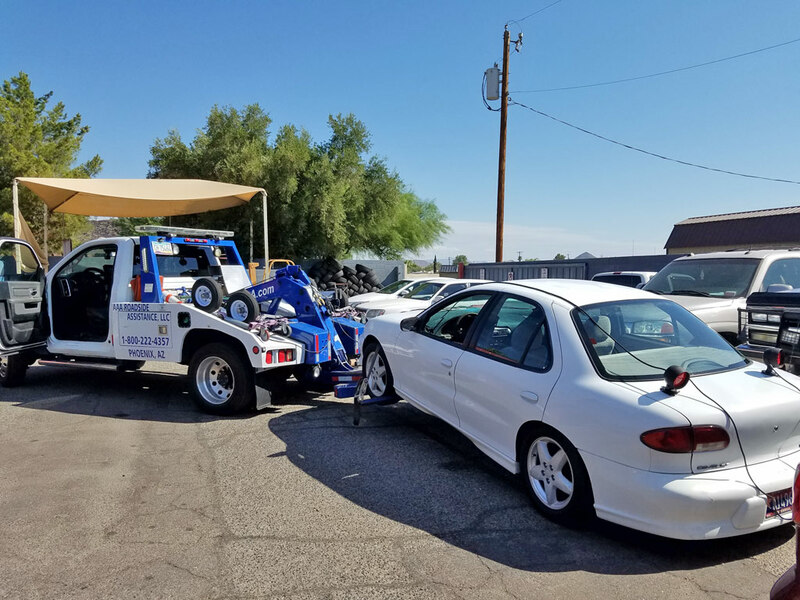 I let the car sit for almost a year before dealing with the problem, which required another tow to the repair shop. The shop determined that the fuel pressure regulator had malfunctioned and was dumping fuel into the engine. With that replaced, it’s now running great again.